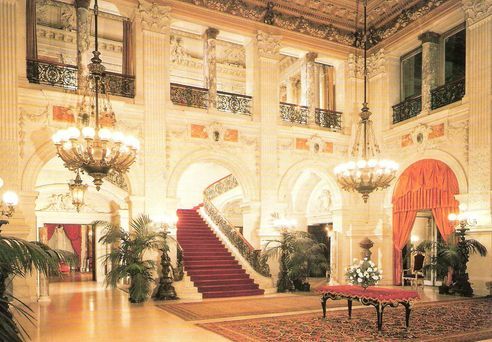 Back Chat: Newport Mansions, Robber Barons and the Best Clam Chowder in Town. 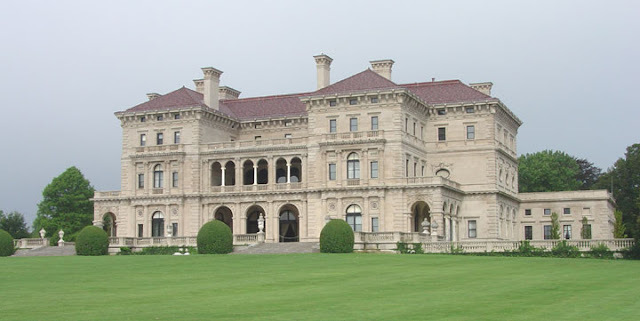 Newport Mansions, Robber Barons and the Best Clam Chowder in Town. Each day in New England brought a new adventure. Robin and James had a treasure trove of surprises and wonders that they revealed to us like wizards conjuring up magic. 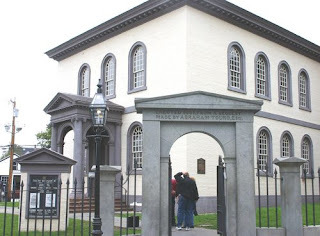 This day we would drive to Newport, Rhode Island and visit one of the mansions of the 'Gilded Age' and then, having feasted our eyes and minds on the excesses of that extraordinary period, we would lunch at 'The Black Pearl Restaurant'. The legendary Black Pearl Restaurant, where clam chowder is an art form and where the feast would be gastronomic and most certainly excessive. Our numbers at Seekonk had swelled with the arrival of cousins Michele and Barry from North Carolina. The beautiful house opened up its arms and welcomed them. We were a happy brood and James' cooking pots got bigger and busier. But now we were off to Newport. Newport is a fascinating place. 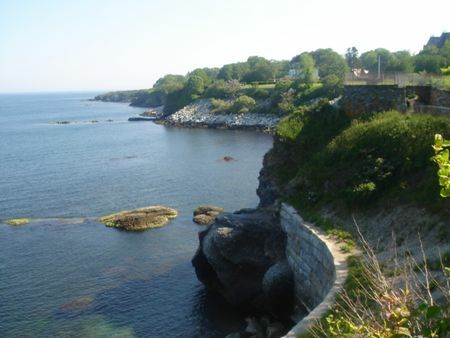 Famed as a New England summer resort, it has fabulous beach cottages along the Atlantic Ocean coastline. Of course, the cottages are actually mansions of huge and lavish proportions. At the turn of the 20th century the nation's wealthiest families would summer at Newport. Captains of Industry, the great capitalists and even the romantic sounding 'Robber Barons' built pleasure palaces with a total disregard for cost and oft times, taste. 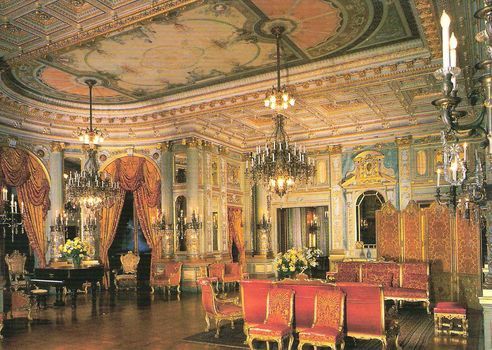 On a whim, whole rooms would be constructed in Europe with the best Italian marble and finest European materials and then shipped to Newport and reassembled. And to these gilded mansions, the families would arrive to spend a brief and glittering time, returning only the following season. We were visiting The Breakers, the summer 'cottage' built for Cornelius Vanderbilt, the grandson of Commodore C. Vanderbilt. Described as a Renaissance Revival summer palace, it was built to replace a wooden 'cottage' that had burnt to the ground. The architect, Richard Morris Hunt, was commissioned to draw his inspiration from the Italian seaside palazzos of Genoa and Turin. Cornelius Vanderbilt demanded that the building be completed in two years and, amazingly, it was! Hundreds of the world's finest craftsmen working tirelessly, completed the 70 - room mansion on time. We were overwhelmed by outrageous opulence from the moment we stepped into the Great Hall. This remarkable space is two stories high with magnificent views of the ocean through French doors opening out onto the loggia. All marble, marble everywhere! Guests would be greeted here, their hosts probably drifting down the sweeping staircase that descends majestically from the floors above. Just imagine the grand entrances that were made, gowns rustling, diamonds flashing and society all a-quiver! We hired head phones with a tour commentary and wandered on into the dining room. Oh my goodness, calling it a 'dining room' is really quite comical and in no way describes this sumptuous room. It is also two stories high and nearly as large as the Great Hall. Red alabaster columns, wonderful ornamental work, glorious crystal chandeliers and lovely plump stone cherubs provide a back drop for this extraordinary 'dining room'. I imagine that nobody would think it odd if there were a hundred people to dinner on any given night. I found the music room fascinating and alluring. Designed and built in Paris, it was dismantled and shipped to Newport for reassembly. Fashioned after the style of the of French Opera and other beautiful French buildings, it is fabulously decorated.. Crimson French cut-velvet upholstery, gilded chairs and sweeping swags of heavy velvet and brocade curtains create a wonderful theatricality. The great and the good of the music world performed there to be enjoyed by 'tout le monde' or simply just the family. I was very intrigued by the fact that the Breakers, for all its splendour, was very much a family home. They spent a full 6 months of the year in Newport. The family rooms on the upper floors of the house were designed for maximum comfort. All the bedrooms had en suite bathrooms with hot and cold running fresh and salt water. Salt water was considered hugely therapeutic. There were speaker phones that connected directly with the servants who would scurry along narrow servant's corridors designed especially for them to move about unseen, yet wide enough to carry a tray. 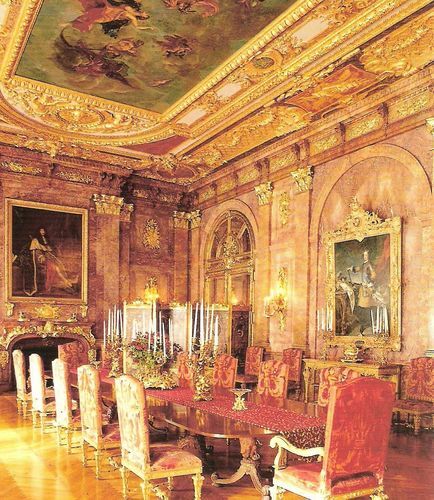 The family quarters were designed by Ogden Codman, a friend of Edith Wharton. In her 1920 novel, The Age Of Innocence, Wharton writes of the social scene in New York and Newport at the turn of the century. She won the Pulitzer Prize for Fiction with this novel and so became the first woman to win the illustrious prize. She had a 'cottage' at Newport called 'Land's End'. So much history and so many tales to tell! We wandered out onto the magnificent lawns that sweep down to the sea. There is a bond between the house and the ocean. The lawns and the changing colours of the sea echo the cool colours of the interior and every aspect of the home commands a view of the sea. It all is quite breathtaking. 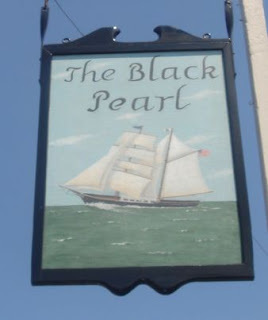 Lunchtime and The Black Pearl was beckoning. We had all heard so much about this very famous restaurant and were famished. The Black Pearl is at Bannisters Wharf in Newport. Once a sail loft and a machine shop, it was built in the 1920's. A certain Barclay H. Warburton 111 (what a wonderful name) transformed it into a restaurant in 1967. He named it after his brigantine rig, The Black Pearl. In the early 70's it was sold and refurbished and has remained in the same family all these years. We had chosen to eat in the area of the restaurant called The Tavern. There were people eating outside at the Waterside Patio but the sun was baking down and we sought shelter in the cool. We were shown to a lovely round table and settled down to feast. We all ordered clam chowder, either by the cup or the bowl. 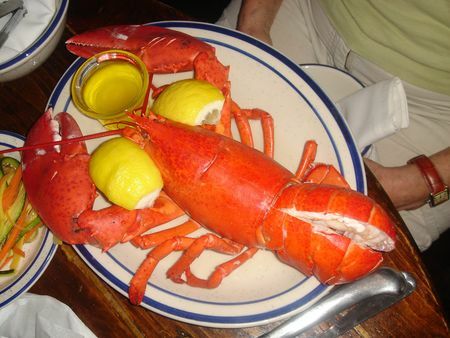 To follow, we ordered steamed lobsters, except Barry who ordered a seared tuna dish. The waiters and waitresses were friendly and seemed tireless. Back and forth they went, always smiling and always getting the order right. The decor includes lots of polished wood and brass, reminiscent of the interior of sail ships of old. So romantic. The Commodore's Room is another dining room. Here one would dress for dinner and dine off fine china and use real silver. The menu is posh, but it certainly includes Clam Chowder! Our chowder arrived and we all became very silent. It was the best clam chowder I had ever eaten. I had been eating this famous soup at every opportunity in New England, but this was food for the gods. We were all of one mind and ate our soup with the attention and reverence it deserved. The recipe for this version of clam chowder is as secret as the coca cola recipe. James has been researching for years trying to discover the secret of The Black Pearl. In his lovely 'Email From America #3' on Back Chat, he tells of his search and how he eventually found the combination of ingredients that satisfied him. He gives the recipe for those who are as ardent as he is about the perfect dish. Check it out under the section 'Email From America'. Then the steamed lobsters. Nothing could have prepared me for the sight of the huge bright red lobster that was placed before me. It was larger than the plate. Garnished simply with lemon and a bowl of melted butter, it was a sight to behold. Some people actually order two of these giants and manage to eat them. The flesh was sweet and succulent and plentiful. The taste is different from the taste of steamed crayfish, which we as South Africans know and love. The remarkable thing is that there is no danger of the lobsters being fished out. They are there in abundance. Hallelujah! food. How on earth did we manage to eat again that evening? Thank you for such a lovely comment. I know that you of all people,would have loved The Black Pearl.